This product, which has been removed from sale, was sold in Weis Markets’ delis in the company’s 204 stores in Pennsylvania, Maryland, Virginia, New Jersey, New York, Delaware and West Virginia. The BLT is packaged in a clear plastic sandwich container. An example of the label has been included with this release. 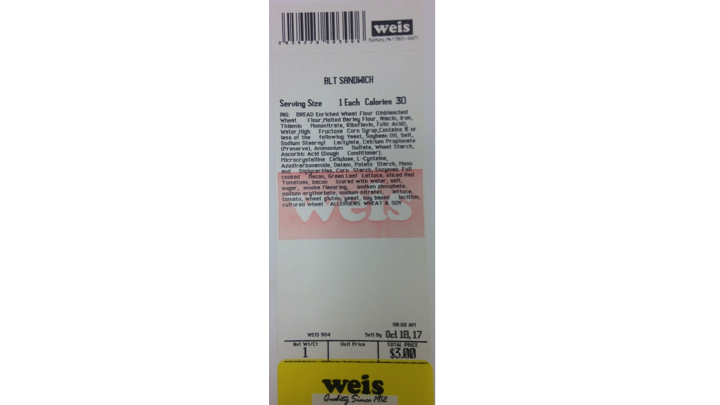 Weis Markets today said it has issued a recall for its store made bacon, lettuce and tomato (BLT) sandwiches since the product’s ingredient label does not list an egg allergen contained in the sandwich’s mayonnaise. People who have an allergy or severe sensitivity to eggs run the risk of serious or life-threatening allergic reaction if they consume this product. One customer reported an egg allergy reaction after eating the recalled BLT sandwich. The customer received an EpiPen injection. No hospitalization was required. The error was caused by a change in labeling. The new labels did not list the undeclared egg allergen (mayonnaise).